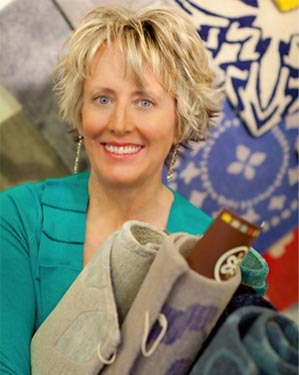 Julie Dasher, our Founder and Lead Designer, has a passion for rug design. Her evolution as a designer began as a fascination with textiles at an early age. Beginning with quilt making and the weaving arts, her interests later evolved into a love of artisan rugs and the exquisite and stunning designs that come to life in Tibetan and New Zealand wool and Chinese silk with the weavers in Nepal and India. Julie receives her inspirations from a variety of places including nature, her extensive designer fabric collection and her children. She has a love of Asian art and an interest in mixed media art that includes textiles in its composition. One of the favorite parts of her day is working directly with interior designers to help them create beautiful rugs for their projects which can showcase their talent and differentiate them in their trade. Formal design training from the Rhodec School in London, as well as her innate creative talents and interest in interior design as an art, have helped in her design journey. Julie's education includes a BS from the University of Virginia and an MBA and MA from Northwestern University. See why Julie supports Goodweave/Rugmark.